Standard-essential patents (SEPs) have been critical to the ICT revolution. SEPs have allowed for the fast rates of innovation diffusion that the world has witnessed in the past 25 years. Yet the SEP system is under pressure. It suffers from a smoldering crisis of confidence as costly legal disputes across several international jurisdictions have caused unpredictable frictions in the markets for standardized technologies. Regulators in several parts of the world are now considering actions that seek to overcome obscurities in the SEP system. Asymmetric information is at the very heart of current problems in the market for SEPs, and all too often resembles a market dominated by a “confusopoly” with little transparency about products, quality and prices. In this paper, we will discuss ideas and concepts for what could be done to maintain a balanced and trusted system that supports technological innovation and at the same time conforms to economic efficiency. Research assistance by Nicolas Botton and Julie Richert is gratefully acknowledged. Observers of the debate about standard essential patents (SEPs) will have noticed that passions run high and that there are radically different views about how these patents are supposed to work, and how they work in practice. It is almost like the Tale of Two Cities, Charles Dickens’s classic novel about social justice and the French revolution. While the technologies that are covered by SEPs – most frequently used in ICT goods and the provision of digital services – are very far away from the world of Dickens, many (but far from all) participants in this debate have opposing views about the strengths and weaknesses of the current SEP “regime”. Just like one of Dickens’ key characters, some companies have been enveloped in costly legal disputes across several jurisdictions, leading to unpredictable frictions in the market for patented and standardized technologies. It is admittedly a generalization, but one view in this debate is that current practices in the SEP system – especially how so-called FRAND rules are interpreted and used – drain the market of financial incentives to develop new upstream technologies. At the same time, opposing observers claim that SEPs are increasingly subject to high transaction costs, not least high potential legal costs, which clog the arteries of downstream innovation. To stylize the positions a little more: some IP holders claim they are effectively blackmailed over the patented technologies they offer to declare as essential to a technological standard under FRAND rules, while some SEP users argue that there are SEP suppliers that behave in ways that resemble extortion. Although the debate about the functioning of SEP markets is subtler in matters of detail, current developments and major strands in the debate give reason to ask whether the system of FRAND-encumbered SEPs is moving towards a breaking point. It is easy to take a pessimistic view about whether the system will break. If the current trend continues, the system is likely to break at some point for the simple reason that companies will not trust it anymore. The series of legal disputes witnessed over the past years – sometimes referred to as the “smartphone patent wars” – has been fodder for a pessimistic reading of “the two tales of SEPs”. While it is common in the business world that disputes over patents and licenses are settled in courts, various SEP disputes have revealed problematic aspects of the SEP market that are different from those disputes that follow the normal stream of business and contracts. Often, the SEP disputes are less concerned about the rights and boundaries of patents, and more about antitrust limits to market behavior: they concern market abusive practices and restrictions to competition as much as they are about intellectual property. If the SEP system actually does break at some point, the consequences would be felt throughout the economy. SEPs have been a critical part of the ICT revolution. SEPs have allowed for the fast rates of innovation diffusion that the world has witnessed over the past quarter of a century. All the computer and Internet related products and services that people are now dependent upon for their private and professional lives are intricate webs of intellectual property. As many as 250,000 patents can be used to claim ownership of some technical specification or design element in a single smartphone (NYT 2012). A laptop, suggests one calculation, implements more than 250 interoperability standards (Biddle et al. 2010), and the number of SEP holders for 3G and 4G standards grew from 2 in 1994 to 130 in 2013 while the number of SEPs rose from fewer than 150 in 1994 to more than 150,000 in 2013 (Galetovic and Gupta 2016). The standardization-body ETSI has registered more than 150,000 declarations of SEPs from companies, and ETSI is just one of many bodies in the world of ICT standardization. For the 3G standard, the same body has about 24,000 patents that have been declared essential. Now, with the economy yet again on the threshold of big technological change, a trusted and credible system for creators and users of technology to standardize proprietary technology would be a boon for innovation, interoperability and – ultimately – the consumers. And there are reasons for optimism. Although many of the problems in the SEP regimes need to be addressed, the numbers above indicate that the SEP system is in fact attractive to patent holders and SEP implementers. It is easy to see why: neither holders nor implementers are presented with alternative options that on the face of it would be far more profitable for them. In other words, there simply would not be as many patents declared as essential if both creators and users of technology believed the SEP system worked to their disadvantage or was grossly unfair. While the reality for some companies may be that legal disputes and unpredictability prompt them to find other ways than SEPs to get access to key technologies for their products, it remains the case that most stakeholders have strong economic incentives to maintain a balanced SEP system that is trusted. First, standard essential patents are an asset for creators of technology because, by becoming essential to a standard, their volumes of sales for technologies that users value rise significantly. As many holders want to raise more revenues for their SEPs and – ideally – have the freedom to contract with buyers on their terms, they can expand their customer base when they agree to sell patented technology in accordance with a set of rules that are designed to prevent SEP holders exploiting the weakness of a customer that has grown dependent on having access to their technology. Second, SEPs are hugely beneficial also to those that buy the licenses – the implementers or users. Through the SEP system, they can access technologies that are interoperable and work with different products and functionalities – and they can do it under conditions that, if history is a guide, in most cases give them stable and predictable terms of contract. As a consequence, both creators and users can focus on their competitive advantages and profit on the economies of scale and specialization. Downstream firms do not need to develop their own upstream technology and upstream firms do not need to package their technologies in end-customer products in order to make their products valuable. Third, standard-setting organisations (SSOs) also have a big stake in an SEP system that works well – and, like creators and users of technology, they would stand to lose significantly if the SEP system were to collapse. Lastly, the biggest beneficiaries are individual consumers – those who buy the end products using FRAND-conditioned SEPs. The advent of SEPs and the rules represented by FRAND have enabled a development of fast technology creation and contributed to the rapid diffusion in ICT goods and ICT-based services. The SEP system has also allowed for new competition, both between existing technologies and brands, and from new ones that have stepped into the market with the ambition to disrupt it, again to the benefit of the consumer. It is difficult to imagine that the ICT and digital development would have been as fast as it has been if SEPs had not been a central feature of the market. The changing fortunes of companies operating in the cellular and smartphone market would not have been possible if there had not been an SEP system that supported competition. Now that the world economy is on the doorstep of new innovations that are dependent on a great number of input technologies – e.g. the Internet-of-Things, transport connectivity and intelligent vehicles – it is crucially important for the consumer that a balanced and functioning SEP system is maintained and that actors in the system converge towards it – which would ultimately meet their economic interests. How does a balanced and functioning SEP market differ from the current system – and how could changes towards a more balanced market design be achieved? In this paper, we will discuss ideas and concepts for what could be done to maintain a balanced and trusted system that supports technological innovation and at the same time conforms to economic efficiency. Unlike many other papers and contributions in this debate, our approach is not based on technical legal arguments, but rather seeks to anchor the purpose of the SEP system, and improvements of it, in economic analysis or what in academic jargon is called political economy. Allowing for a market-led discovery process of new technologies, leading to market-based pricing of technologies, in a SEP system that is currently anchored in a price commitment by those who offer licenses on FRAND terms. Ensuring that markets are transparent and that there is an incentive or, in other words, a premium for reducing – rather than expanding – non-transparent and directly obscure market and contract practices, which have led to confusion, legal risks, litigation and high transaction costs for involved stakeholders. Therefore, the connaisseur of standards and patents would immediately spot that our focus is the market – and how it works. An alternative way of describing these two economic aspects of the SEP system is that they directly relate to the use of a standard that is based on proprietary technology, which is a somewhat odd creature in a market-based economy that otherwise seeks to foster or maintain competition. The protection of intellectual property is important to support innovation, but in the current SEP system, the market power given to a patent holder through the original exclusivity rights is reinforced by the standard. In other words, the standard is multiplying the economic value of the original patent. Therefore, there is an element of political economy involved, especially behavior of rent seeking and the hierarchy of firms on the markets (affecting the market distribution of income). The first challenge that we outline concerns the actual standardization process, the SEP declaration and the time when prices are formed. Decisions about prices happen at different occasions, but a common approach – underpinned by several legal and competition-policy interpretations of FRAND rules – is that the relevant benchmark for a FRAND price is the price of the license before it is known whether a patent is essential to a standard, let alone the SEP declaration itself. The nature of incentives and market power between different companies changes once a standard has been established and it is clear which technologies are essential to the standard and deemed valuable by the market. In the process before a standard has been established, the creators of technology have an interest to signal commitment to low prices and to patent as much as possible around the likely standard. Importantly, all that happens before there is any real market valuation of the technology – before there has been a discovery of what utility market participants will have for the technology. The second challenge concerns how market behavior evolves after the decision of standardization and whether parties to a contract have incentives to clarify or obscure information in the market for SEP licenses. Obviously, many SEP cases that have been litigated over the last decade reveal an astonishing degree of obscurity between contracting parties, let alone practices that are directly intended to confuse the buyer and other market participants. Most of these problems can be attributed to asymmetric information about product quality and prices, which is created by state-of-the-art SEP standardization processes. 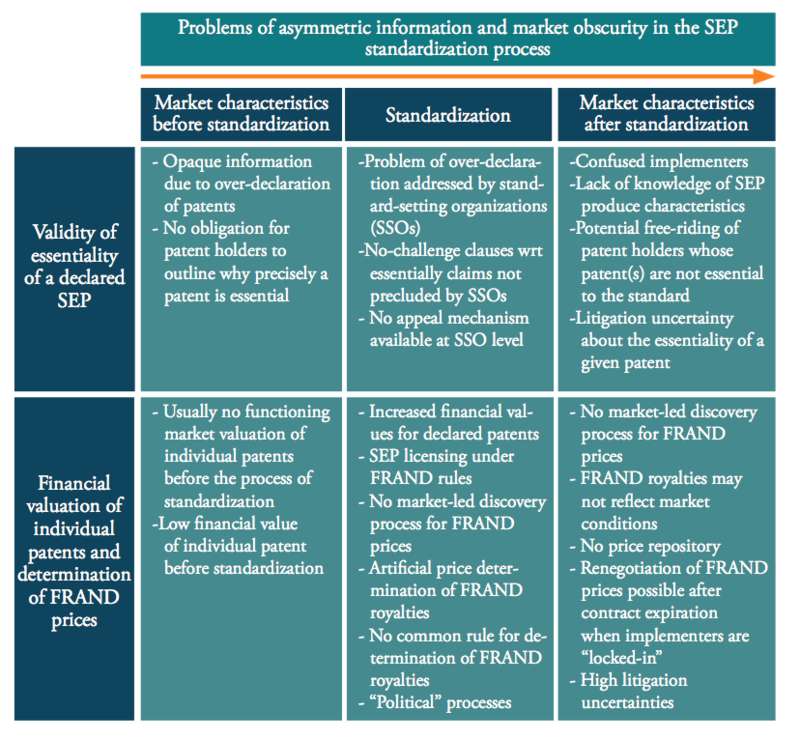 Figure 1 provides an overview of the problems of asymmetric information and market characteristics along the process of SEP standardization. There are reasons to suspect, however, that the two features are partly complementary as far as market practices are concerned: some problems of market transparency and obscurity are a reflection of a price mechanism for FRAND-encumbered SEPs that is in fact artificial. The argument we will pursue throughout the paper is that the flaws and frictions that have emerged in the SEP system in the past are direct reflections of these two challenges, and that the SEP system is in need of clarification of the commitments and flexibilities that come under FRAND rules. Furthermore, we argue that the only two bodies that can provide such clarification are courts and standard-setting organisations. Other actors can aid that development, but they cannot compensate for a situation where courts and standardization bodies cannot or will not provide clarification. Competition authorities, for example, have recently helped to shape a clearer limitation of market practices by applying standard antitrust economics through guidelines and case decisions. However, there are limits to what they can do because they operate ex-post and ideally should not be a price regulator. Regulators in several parts of the world are now also considering actions that seek to overcome obscurity and asymmetric information in the SEP system. It is easy to understand why, but there are clear dangers that uncoordinated regulatory action, soft or hard, would create substantially more uncertainty and legal frictions rather than less. The technologies concerned are usually used, licensed and sourced globally – and distinct deviations between countries would risk causing clear incentives to localize contracts and production in some jurisdictions rather than others. Such “forum shopping” most likely takes place already, at least as far as litigation is concerned, and improvements of the system should effectively reduce the possible arbitrage between jurisdictions, rather than expanding it. Before consideration is given to possible changes of the current SEP system, it is first necessary to understand why we have come to a point where they are deemed necessary. After all, for many outside observers the practices around SEPs are a bit obscure and often seen as part of a standardization system that has worked remarkably well in the past. Furthermore, if it is now relevant for government authorities to provide guidance or (self-) regulation about how the SEP system is due to evolve, it is important to understand current problems and how they are actually manifested in reality. Let us consider some of the events and developments that have shaped the current system and led to frictions. First, markets, technology and business models have changed. Developments over the past decade have had a significant impact on how companies compete and where revenues are generated. Some businesses have been forced to change because the high-tech or ICT market has changed, and they may not be producing today what they produced when the SEP system emerged. New businesses have entered the SEP system, and there is generally a much higher degree of variation between companies that have a stake in it. With the rise of new companies on both sides of the SEP market, cross-licensing between a relatively small number of companies like Apple, Samsung, Microsoft and Google may take a much smaller share in overall SEP licensing in the future. Market and technological change over the years has led to a greater degree of corporate specialization – and that change has gradually delineated the economic interests in the SEP system. There are now many more stakeholders in the system and, even if many of them still both contribute to and implement SEPs, there is today much less of a balance inside and between companies in how they perceive the importance of revenues generated from either using or contributing SEPs. Second, there has been a marked rise in SEP litigation cases over the years (see Annex 1). Increasing legal costs for managing SEPs are a distinct aspect of that development – and one that has led to expectations of potentially high transaction costs for participating as a contributor to, or user of, SEPs. Still, a more noxious aspect is the uncertainty that litigation has caused over the marketability of designated SEP-technology and SEP-based products. If companies are at risk of either having licenses being used unfairly or being exposed to injunctions that prevent them to compete, at least temporarily, that in fact constitutes a significant deterrent against using the SEP system in the future. Increased litigation is also a reflection of market practices that partly have become obscure and somewhat impenetrable for those that do not have long experience of SEPs or significant legal resources allowing them to safely navigate the system of standards and patents (e.g. emerging Internet-of-Things companies). In many respects, the evolution of standards and markets has led to less transparency. It has worked against some market participants’ ambition to gradually reduce problems of asymmetric information and the potential for market abusive practices, and can be regarded as an implicit competitive advantage (or subsidy) to incumbent businesses that understand the rules of the game. Third, courts have increasingly defined market conditions for SEPs. As a consequence of litigation, courts in key markets in the world have increasingly become the theatre for defining the practices for FRAND-encumbered SEPs: how they are negotiated and what terms of contract that are considered fair and reasonable. While it is only natural that courts are the final instance for resolving legal or commercial disputes, all parties have not uniformly accepted what these decisions entail for future contracts and commercial conditions. As the decisions by the courts are reflected in work to set precedents and guidelines for the future, it is not surprising that there are increasing tensions about how exactly the system should work. The growing commercial values involved – partly through new technological developments – only serve to underline the importance for individual companies of the direction of travel for the entire SEP system. Fourth, competition authorities are increasingly wary of the imbalances of the current system. Competition authorities have increasingly taken an interest in how SEPs are used and negotiated, and hence introduced a greater degree of antitrust considerations in the world of standards and patents. Undoubtedly, the emerging role of competition authorities all over the world in SEPs will influence the market and should already now be high up on the agenda in the discussions about how FRAND-encumbered SEPs should be negotiated and contracted. What has been a voluntary system decided by stakeholders themselves now has clearer limitations for how the market power granted through a standard could be used in actual contracts. While decisions by competition authorities do not necessarily set precedents, they have arguably done so in the field of SEPs, with feedback effects to courts. In addition, both the European Commission and the Federal Trade Commission in the United States have made explicit decisions with regard to the use of injunctions. The economic analysis behind these decisions suggest that the scope of the interest for competition authorities goes beyond the mere issue of injunctions. Fifth, regulators are about to step in. Other regulators than competition authorities have started to lay down some markers for how they think the market for FRAND-encumbered SEPs should evolve to support faster diffusion of innovation and the participation of companies with less experience than others of how to manage SEPs. This is a significant development and one that, potentially, can have unprecedented consequences for how the SEP system will evolve. In Europe, there is currently a process underway to possibly establish SEP-guidelines and, given the centrality of the European market for SEPs, it is worthwhile to understand the background, perception and motivations of regulatory authorities taking an interest in the evolution of SEPs. The important role of SEPs was identified by the European Commission as a key issue for promoting a Digital Single Market (DSM) in Europe. Adopted in May 2015, the DSM initiative intends to enhance and promote digital opportunities and ensure that businesses and individuals across the EU can access online services “fairly and freely” (European Commission (2015a). Accomplishing the goals of the DSM has also become one of the key political priorities of the EU, and therefore the aim of establishing a more predictable and balanced framework for SEPs comes with some political tailwind (European Commission 2017; 2016). This is underlined by the European Commission’s observation that the current SEP framework is delaying the benefits of standardized technologies because of several uncertainties in the current standardization frameworks. Businesses are perceived to be too slow to capture the opportunities emerging from new technologies, or directly deterred from approaching them because of opaque licensing terms related to SEPs and unpredictability in the access of standardized technologies. The concerns identified range from a lack of transparent information to uncertainties of enforcement and unclear pricing of patented technologies. Addressing these issues is considered essential for EU businesses to remain competitive in ICT sectors and in newly emerging markets, like the Internet-of-Things and the implementation and diffusion of digital innovations across sectors. Opaque information about SEP exposures: with an increasing number of patents being declared as essential to ICT standardization, the system lacks an effective and reliable tool for licensees to identify which patents and licenses are necessary for them to implement in products. Unclear valuation of the patented technologies: there is no widely-accepted valuation method used to calculate the value of licensing and royalty fees, including FRAND fees and non-pecuniary conditions. As a consequence, there are several uncertainties and imponderables in the valuation of patented technologies when they read on a standard, which results in questions concerning the justifiability of royalties, causing a significant lack of predictability regarding legitimate and proportional licensing fees. Risks of uncertainty in enforcement: there are several uncertainties in the enforcement of SEPs due to incomplete framework(s) of SEP licensing. This has previously led to costly and long court cases that have given SEPs a bad reputation. Uncertainties in the enforcement of rights can, according to the European Commission, prevent businesses from taking part in the development of IoT and other promising areas of rapid innovation. The date by which the European Commission wishes to issue guidelines on these matters is the autumn of 2017. FRAND is a legal term that stands for Fair, Reasonable and non-Discriminatory licensing conditions. Standardization bodies often request that the company holding a patent for a technology needs to agree to license on FRAND terms in order for the technology to become essential to a standard. Many SEP “holders” are at the same time SEP “users” and it is therefore not correct to generally portray this debate as featuring only two groups of companies with opposing views on how to maintain or reform the SEP system. Given that policy ambition, it is natural to ask: what problems, more specifically, need fixing for the SEP-system to remain a central part of new technology creation and innovation? As already mentioned above, due to the nature of most problems of the current system, any improvement will have to start with transparency and ensuring that there is clarification about the actual market: what is the product (license) that is offered and why is it essential to the standard? And there is no point beating about the bush: currently, SEP markets are all-too-often obscure and there is such a degree of market failure that there is no other way than for standard-setting bodies to become far more demanding about the conditions for a patented technology to become part of a standard. Several court decisions in both Europe and the United States have illustrated the obscurity of the SEP market, notably Huawei v. ZTE, which went into a prescriptive direction for how negotiations between contracting parties should be structured. This obscurity is partly related to the high levels of asymmetric information between the seller and the buyer of SEP licenses. Information about the essentiality of patents as well as the level and differentiation of royalty fees among buyers is often only available to the licensor, while implementers have fragmented information. Consequently, users of SEPs are often unaware of what they have purchased exactly and, as some disputes have shown, whether the license effectively protects them against patent infringement litigation. In a market that is obscure, there is also the risk that users may refuse to purchase licenses because of lack of information or doubts about prices, patent validity or essentiality claims in the first place. This is at the very heart of current problems in the market for SEPs, and all too often resembles a market dominated by a “confusopoly” with lacking transparency about products, quality and prices (see, e.g., Ahmed 2015, Kalaycı 2015; see Figure 2). As always, Dilbert puts the finger on the right problem. Note: Adams (1997) introduced the word confusopoly. The word is a combination of confusion and monopoly (or rather oligopoly), defining it as “a group of companies with similar products who intentionally confuse customers instead of competing on price”. Examples of industries in which confusopolies exist (according to Adams) include telephone service, insurance, mortgage loans, banking, and financial services. Source of graphic: http://dilbert.com/strip/2010-11-21. The introduction of FRAND rules intended to improve transparency by mitigating potential market abuse as well as the problems of asymmetric information in SEP markets. That development is still under way and there has been a gradual and evolutionary development in which courts have increasingly interpreted these rules and what they should mean in practice. There is quite some distance to go before court decisions have given clarity to all matters that need to be cleared up – and it is not exactly a linear development either. Nor are all courts necessarily arriving to the same conclusions. Some stakeholders doubt that they can. A study by the Joint Research Centre of the European Commission (2015, p. 11), for example, argues that “the variety of licensing practices has made it more difficult to identify a consensual approach to FRAND licensing.” And, rather than resolving problems, the “involvement in litigation has drawn much attention, fueling controversy on the interpretation and effectiveness of FRAND commitments in the current industry context” (JRC 2015, p. 11). Amplifying the obscurity is the fragmented information available for parties outside the license contracts. Lack of data regarding the quality or essentiality of an SEP as well as licensing fees are already causing problems for the contracting parties. Consequently, many SEP stakeholders have raised concerns over issues that are difficult to empirically validate – and that is an even bigger challenge for outside observers. The study by the Joint Research Centre (JRC 2015, p. 16) also makes the point that “there is no empirical evidence that clearly breaks the tie between the “hold-up” and “hold-out” arguments.” In that context, a recent report commissioned by the European Commission makes a similar argument, stating that there is “no reliable empirical analysis of hold-up within SSO-based standardization processes.” (Regibeau et al. 2016, p. 12). Proposals for improvements of the SEP system have to take aim at the low degree of market transparency around SEPs, which lies at the heart of the problem of artificial pricing mechanisms in SEP markets. In the past years, there have also been claims that current FRAND requirements are insufficient, and several concerns have focused at the over-declaration of SEPs, no-challenge clauses regarding the standard-essentiality of a patent and confidentiality obligations concerning royalty fees effectively preventing market forces from working towards more transparent, balanced and commonly accepted outcomes. There are also demands for both greater flexibility and limits for how license prices should be determined in the FRAND context. Some suggest that there should be a greater role for price variation in the same way as there are royalty caps. Others argue for pricing models based on the concept of return on investment or pricing according to how the license buyer uses the purchased technology. Let us look closer at some of the main ideas. Over-declaration of SEPs is a major determinant of obscurity in SEP markets. The declaration is a decision exclusive to the patent holder and a self-declaratory process. However, several studies show how a significant part of the patents declared as standard-essential are in fact non-essential for the implementation of the standard or not even covered by the standard’s specifications (see for instance Audenrode et al. 2017 and Pohlmann and Blind, 2016). Problems arise from the fact that neither SSOs nor patent authorities systematically conduct essentiality checks, while at the same time patent holders generally have an incentive to over-declare patents as they aim to protect the enforceability of potential rights. As outlined by van Audenrode et al. (2017), patent holders tend to err towards declaring an SEP even when they doubt the standard-essential characteristics of a particular patent. A recent study done for the European Commission articulated the same observation: “…in a world where there is little objective verification of essentiality, there is an incentive for patent-holders to declare a large number of their IPRs as essential, if only because royalty payments tend to increase with the size of the licensed portfolio” (Regibeau et al. 2017). In addition, SSOs often encourage patent holders to declare all patents that might be essential for a given standard. The problems associated with over-declaration have been intensively discussed by policymakers in the past, although solutions have not been found. In academia, the problem of invalid SEPs is still “under-recognised” (van Audenrode 2017, p. 3), leading to significant short-comings of empirical analysis. At the same time, policymakers as well as courts have so far struggled to find solutions to the problem of patent essentiality. None of this is surprising. Essentiality characteristics are indeed a complex matter. Patent claims can be exhausted or amended over time. The scope of protection of a single family or different national patents can vary around the world. In addition, as standards evolve over time, essentiality might change too. For all SEP stakeholders – including patent offices, SSOs and (potential) regulators – thorough essentiality checks can therefore be time consuming and costly. Markets are generally in the best position to determine the essentiality or the value of a commodity – in this case the value of a patent that has been claimed essential to a certain standard. However, under the current system, a market-based determination of the essentiality and value of a given patent is often curtailed by market participants themselves as well as contractual arrangements. For many companies, including resourceful multinationals, there are often very high transaction costs associated with obtaining the information about the essentiality and value of the SEPs that they are offered. This is particularly the case when companies are subject to so-called “no challenge clauses” (or no-contest clauses). No-challenge clauses forbid SEP implementers to challenge the validity (or enforceability) of a patent declared as SEP or participate in any challenge or aid any third party challenging an SEP (see, e.g., Collins 2015). As a result, SEP implementers – individually or collectively – are prevented from challenging an SEP, even if they come to the conclusion that an SEP is not essential to a given standard. No-challenge clauses are, therefore, a powerful means to obscure the quality and essentiality of a patent for actors that are less attentive to the needs of SEP implementers. No-challenge clauses underpin the “confusopoly” that characterizes parts of the SEP market. In effect, buyers may have to purchase several licenses for patents that are not essential and, as a consequence, the costs go up for end customers and the allocation of market resources gets distorted. In other words, the over-declaration of patents and non-transparency in matters of essentiality enable and potentially reinforce pricing strategies that stand in opposition to the public desire of promoting innovation and competition. Essentiality checks are expensive for everyone, including SEP holders and SSOs, which is why there are no mandatory essentiality checks. It is virtually impossible for an SSO to conduct essentiality checks for every declared SEP. There is, however, no way to improve the SEP market without greater information and transparency about the product and its essentiality. Therefore, steps have to be taken to improve transparency. While no system can be made perfect, there are promising ideas for how improvements can be made. A first step is for SSOs to selectively examine the essentiality of patents, either randomly or by focusing on standards that are more important than others. While SSOs may not have the technical expertise to conduct such reviews themselves, they can commission patent offices for such work. There are also ways for SSOs to make essentiality claims to have a greater effect on the information imbalance between holders and users. For instance, it would be reasonable for SSOs to have an appeal mechanism to which parties could turn for an examination of the essentiality of a patent when it is in doubt. After all, essentiality to the standard is the core of the product that a buyer is purchasing through a license and, given the role of an SSO to develop the standard, there is no way to escape that non-essentiality has to be acknowledged by the SSO for the market to improve. An appeal mechanism would be a powerful institution within the SEP system that gradually would lead to greater clarity about what licenses exactly that a standard implementer needs to acquire and pay for. It would help the market to move towards the patents that technically really matter and make the SEP license a factor only of the relevant SEPs. This should be a critical part of the SEP system. The advantages of a standard are undermined when prices and buyer costs do not reflect the essentiality of a technology to a standard. A second step could be to incentivize patent holders to be more selective in their declaration of patents by demanding a fee for every declaration. Increasing the cost of SEP declarations, as suggested by Regibeau et al. (2017), might mitigate the problem of over-declaration. However, such a fee would be no panacea. While it could encourage moderation in the declaration process, it would also have to be a high fee in order to be effective. And a high fee is difficult to square with the nature of market and technological discovery – which is evolutionary – and the fact that expected royalty fees are often unknown at the time of the declaration. Therefore, a high fee could also be a deterrent against the declaration of patents that are essential or might become essential in the future, which damages the relevance of the standard. The market reality is that companies patent before and during the standard-setting process, and it is difficult for all actors in the early part of the process to know exactly what patents that really are essential to a standard. For the SEP system to work, it needs to allow the necessary space for such discovery. An alternative approach is therefore that, while there is no registration fee for the initial declaration, there is a fee introduced on each declared SEP at a certain point after the standardization process when holders have had time to review the essentiality of all their declared SEPs. As a precondition for trust in the system, it is in the interest of competing SEP holders that buyers pay for essential patents only and that resources are allocated in accordance with the standard and market demand, and the purpose of the fee would therefore be to incentivize SEP holders to move in that direction by gradually taking away patents that have proven to be non-essential. A third option is for SSOs to demand that a patent holder should specify, generally or to a prospective customer, why an SEP is essential to a standard. After all, it should be a standard market practice in any well-regulated market economy that the seller provides the buyer with sufficient information about what they are selling. And it should be normal for SEP markets that patent owners provide sufficient information about why potential implementers need their patents for the implementation of a particular standard. Given the substantial amount of asymmetric information between the seller and buyer, it is reasonable to put significant information responsibilities on the seller. Undoubtedly, this is a responsibility that should become greater when a seller offers a license to a portfolio of patents rather than a single patent as essentiality is even more burdensome to examine for patent portfolios under the current system. In other words, SSOs can complement their FRAND principles by demanding sellers to specify to a consumer how their SEPs read on the standard. A fourth area for improvement concerns no-challenge clauses in license contracts for FRAND-encumbered SEPs. While a prohibition of such clauses would not directly target over-declaration, it would incentivize SEP holders to be more specific in their essentiality claims when they are negotiating with their customers. The invalidation of no-challenge clauses would empower SEP implementers to challenge the validity of declared SEPs before a court, and thereby discipline SEP holders in their declaration practice in the first place. The prohibition of no-challenge clauses might also trigger enhanced cooperation between stakeholders of SSOs, individual corporations and standard consortia to significantly improve the accuracy of essentiality declarations. These alternative approaches are not mutually exclusive: they can be combined. It is important to recognize that it is difficult, if not impossible, to get improvements in the SEP market by “command-and-control” type of regulations by SSOs that would mandate one specific behavior in all potential situations. Arguably, it is also unlikely that all SEP markets would improve if all SSOs should begin to register all declared SEPs in databases. What SSOs can do is to establish institutions and set the incentives for stakeholders to increase transparency and reduce obscurity about the supply of (and demand for) licenses – that is, provide greater clarity about the product and the market: which patents are truly essential for a standard and, consequently, what a standard implementer should be paying for. The concept of FRAND is vague on what is the core aspect of FRAND-encumbered SEPs: setting the royalty rate for a patent that is essential to a standard. There is no particular proscriptive model for how that process should be determined, let alone the price level. It is obvious, however, that the SEP system has to be based on a price commitment by the seller. The combination of a patent and a standard that grants the holder such market power that, without a price commitment, the market would be distorted and the SEP system would be discarded at some point. However, what that actual price should be is a far more complicated issue, and one that can lead to inefficient forms of resource allocation, e.g. money spent or not spent on particular forms of research and development on the side of both SEP holders and implementers. In short, technology creators can be incentivized to develop technologies that are of little relevance to the market if the price mechanism rewards that type of behavior. Getting the prices right is therefore not just an issue of determining what is fair and reasonable; it also informs companies in their decisions about what technologies to invest in and how they strategize to compete in the future. While it is important to recognize the limits of FRAND rules as far as prices are concerned, and not exaggerate what court decisions in the past have established for the price-setting process, it seems clear that there have been developments through court decisions and competition authorities, which have gradually given more information about how “FRAND rates” should be determined. In a way, one can see developments in many jurisdictions if the form of convergence to specific interpretations of FRAND that limit the space for negotiations of FRAND-encumbered SEPs to deviate from a norm. A recent study done for the European Commission argues along the same lines: “[i]t follows immediately that the right conceptual benchmark for the determination of FRAND rates are the rates that independent patent-holders would have been able to charge ex-ante, i.e. before the standard has been chosen and, hence before any patent-holder or user knows whether a given patent will actually end up reading on the standard” (Regibeau et al. 2016, p. 27). However, while it is important to get the basic theoretical concepts right, and acknowledge that there has to be a price commitment for a system of standardization to work (especially if the technologies in question are under patents), there are many practical issues to consider. An ex-ante price, for instance, may not be possible to determine – and, from a market perspective, it may not be a good price. A price that clearly does not reflect the market valuation of a technology will give companies incentives to allocate resources in ways that do not support technological development and growth. If the current trends of determining the ex-ante FRAND rate locks the system into an artificial type of pricing – setting the price before there has been any real market valuation of it – there are clear risks of the price itself distorting the market. However, what complicates the process of determining prices is that the standard itself will represent such a large part of the value of the license that it becomes difficult to get the market to determine prices in an evolutionary way. Are there alternative ways to approach the issue about what should constitute a price commitment? Recently, there have been approaches suggested that could work as alternative or complementary models to the current approach of a market-driven ex-ante price determination. For instance, the above-mentioned study by the Joint Research Centre has discussed the introduction of a market-corrective practice that would ensure SEP holders that they get a predicted return on investment (RoI) if the revenues from normal market sales do not cover the cost of developing the technology. The logic is simple: if the creator of the technology does not get adequately rewarded, it follows that the company will not be incentivized to put resources into research and development that could improve technology and lead to more downstream innovation. This return on investment concept, however, is both principally awkward and impracticable. There is no guaranteed market reward for any investment in a market economy – and if such a guarantee existed, it would distort the market and lead the innovation process in a direction that is unlikely to reflect market demand and consumer preferences. Furthermore, it is difficult, to say the least, to find a way to objectively assign development costs within a firm to one particular patent – and that challenge gets much bigger if the sum also should be considered legitimate by the buyers. There would be incentives for patent holders to exaggerate investment (including research and development) costs, which are difficult to objectively evaluate from the outside, similar to intra-firm transfer pricing arrangements, which constantly give rise for legal disputes. Logically, for such a system to fairly represent the success of a technology creator, any reward in excess of the established RoI metric would have to be redistributed from the patent holder to the users, further reducing the competitive instinct of SEP suppliers. In addition, a return-on-investment concept for determining the “FRAND rate” would likely give companies incentives to declare (artificially inflated) low-valued patents to SSOs while avoid doing it with high-valued patents. The critical task now is to make the SEP market more transparent and lead market participants (sellers and buyers) to contract over technologies that are essential to a standard, and the RoI concept stands in opposition to that quest. Another idea that has been drafted suggests that the royalty could be determined by the end-use of an SEP, and that the value of that end-product should influence the price that a buyer pays for an SEP. Clearly, this has been part of SEP contracts for quite some time and holders, like any other market participant, have set their prices in accordance with how valuable they think an upstream technology is for a downstream product. Often it has worked smoothly, and as long as a holder is not trying to increase the price when buyers have been locked into using a standard, it should be up to buyers and sellers to determine what the price should be. In a way, inspiration for such an approach can also be drawn from decisions where courts have attempted to determine the value of a patent. However, there is a context to how this idea is now being promoted which makes it awkward and impractical. While courts have sought to determine a fair value for a patent when other market circumstances have not made that possible, that process has not been an exercise prefaced with the intention of ensuring higher rates for the patent holder. And that is where it differs. The case now for a use-based approach is predominantly about effecting a new form of corporate redistribution where downstream innovators implicitly would be taxed for the purpose of increasing the revenues of the upstream innovator. Importantly, it is partly about trying to leverage the standard itself for the determination of the price and to get the market distribution of income to work more to the benefit of technology contributors. Obviously, this approach intends to correct the changing fortunes of businesses, where margins often are better in downstream markets and increasingly squeezed in upstream markets. It is thus not a surprising development: given market developments, that no one wants to end up in a market position where other companies in the value chain are better at capturing potential margins. Creating a way of redistributing revenues backwards through the value chain is an appealing idea if the downstream users are considered to benefit unfairly from the upstream contributor. However, it is difficult to see how a use-based approach could work in practice when the task remains to set the norms for determining the FRAND price – the ex-ante price that discounts from the market value that comes from being part of a standard. A use-based approach could, in the first place, be discriminatory as users could be charged a differentiated royalty for the same technology. Given the general market development, this could have effects on the competitive relationship between downstream users of the SEP. A key point of FRAND still is to minimize such effects and ensure that downstream competition is not determined by the contract relation that different parties have with an upstream contributor of technology. Hence, an end-use approach would run the risk of undermining the current system of standardization because users would not be able to trust that it ensures stable conditions for competitive neutrality. This judgment holds even if the discrimination takes place at the level of product classes and not just between companies that are competing head-to-head with similar products. Finally, an end-use approach to establishing a policy-based FRAND rate (policy set by SSO, courts, antitrust authorities or market regulators) would face the same practical difficulties as determining a FRAND rate based on the return on investment for the patent holder. It is hardly easier to design a credible system for determining the value of an input for the final product than it is crafting a trusted estimate over the costs incurred for developing a patent. It has been attempted by courts in patent litigations but, even if it is a practice that is necessary when all other alternatives have failed, it is not exactly a straight-forward process. Nor are the outcomes necessarily more advantageous for companies who think they are poorly rewarded for their upstream technologies because, as expressed by opinions by the U.S. Federal Circuit, the valuation of royalties should be based on the “smallest salable patent-practicing unit” with the purpose “to calculate damages based on the product incorporating the patent, not a downstream product with a value much less related to the patent’s value” (Muris 2017, p. 6). In a similar vein, the European Commission’s “Horizontal Guidelines” express the view that the preferred method of patent valuation is the “licensing fees charged by the company in question for the relevant patents in a competitive environment before the industry has been locked into the standard (ex ante)…” (European Commission, 2011, para. 288-89). There is a market logic behind the skepticism to a use-based approach. The value of a connectivity standard in an automobile, for instance, differ between brands and models, and over time as products, consumer preferences and market competition change. Markets can be fickle and the whole point of market-driven innovation is that the hedonic outcome for customers, not the inputs and the costs incurred, determines the value of a good or service. Consequently, a use-based approach would risk resulting in greater costs for those companies that are good at understanding what customers are willing to pay for. What the consequences would be in practice is actually harder to predict. In sectors where SEPs are important – predominantly ICT – technological development forces rapid changes in products and markets, and what is relevant for the valuation of an SEP at one point could be irrelevant soon after. Furthermore, when standards are developed and/or when the prices are first determined, the actual shape and structure of potential downstream markets are often unknown. There is much talk now about the future shape of the IoT market, and expectations about growing connectivity between various products have fueled controversy about the entire SEP system. Yet this discussion shows that the policy aspects of the SEP system are sometimes distant from market realities. For instance, today there are greater connectivity opportunities for a refrigerator, and those are likely to increase in the future. But what are consumers prepared to pay for the opportunity to get an automatic update when they are about to run out of milk and butter? Can automated retail delivery be connected to the technology, and assist households in making sure there is food in the refrigerator when they need it? If so, how much would consumers be willing to pay for that service? All these aspects of the market are unknown. And, therefore, there is no objective way of singling out the value of one particular input technology that would not be prone to a very big scope of interpretation, negotiation and manipulation. Consequently, the use-based approach does not reduce the artificiality associated with determining an ex-ante price for the FRAND royalty. Importantly, neither the RoI nor the end-use approach takes us any closer to a market which is more transparent and predictable, and less like the “confusopoly” that too often is allowed to set the tone of the SEPs market. Both approaches would create more problems than they would solve. They would introduce greater uncertainties about the terms of pricing and more frictions between contracting parties that cannot find alternative arrangements that are reasonably reliable. Furthermore, they do not make the system more reflective of market conditions and how market participants’ valuations evolve over time. An alternative approach is to change the price setting approach and allow for much greater price variation – or price ranges – in contracts of FRAND-encumbered SEPs. One argument behind this approach is that the devil of FRAND is always in the details – and that there is no way to settle on one “objective” FRAND price that could steer markets infinitely. It has been argued that FRAND royalty rates or licensing fees that are “deemed” to conform to FRAND always constitute a system of artificial pricing, in which prices do not properly reflect supply and demand characteristics, which eventually causes a misallocation of resources, including distorted investments in technological R&D and business model adaptation. Furthermore, as illustrated by the high number of FRAND litigations, it is often left to courts to determine appropriate FRAND rates and negotiation practices, although courts are not in the best position to determine an “objective” market price. This view is thought-provoking – for reasons that we will return to soon. It is difficult, however, to get a laissez-faire or price-range approach to work in a system whose credibility ultimately has to be based on a price commitment by SEP holders. The process of standardization is very likely to lose trust if an upstream input supplier is given big pricing power and when that is already known at the time of the actual setting of the standard. Rather, such approaches take us back to the idea that FRAND rules are actually supposed to mitigate the granting of additional market power to companies that already enjoy exclusivity rights through patents. The market distortions that are likely to follow such market power would provide incentives for users to develop own solutions rather than accepting a standard, and consequently there would be increased technological fragmentation and greater problems of interoperability between products and platforms. What makes the “pricing flexibility” view interesting, however, is that it accounts for what indeed constitutes a (perhaps the) major problem of the current system: correcting a royalty determined artificially before or after the standard had been developed and decided. The FRAND concept of fair and reasonable prices may by all means be necessary, but it does not ensure that a royalty is set at a level that reflects market conditions and what, beyond the premium that is caused by a patent being essential to a standard, is a relevant market valuation. While there is a degree of flexibility in negotiations, the point with FRAND rules is that there should not be any significant ex-post changes in royalties. Ex-post prices that deviate from the ex-ante valuation should in principle not be part of the market. In reality, however, many holders and implementers are accepting that practice, but developments through courts and authorities – moving in the direction of the ex-ante valuation – may be about to reduce that flexibility. Locking the market to the ex-ante price is awkward. Courts and other institutions respond to litigation claims and give guidance on what general principles like fair and reasonable mean in practice, but their task is not to determine if other developments than the standard have given reason for the royalty to change. And such changes can go in both directions, as there can be situations when a patent holder is motivated to either cut or increase a royalty. Prices would then more adequately signal how market participants should allocate resources, notably R&D investment, for economic payoffs to improve. Hence, the merit of this approach is to avoid that markets, and not just individual companies, get locked into using a sub-optimal technology because of failing incentives to encourage new technology and more competition. The pricing flexibility view is also interesting because, despite FRAND rules and court decisions, the current regime all too often leaves participants in the dark about the FRAND royalties charged by SEP holders to other firms, including firms operating in different positions along the same value chain or in other sectors. Hence, adequately improving price transparency would have to take precedence over attempts to amend or detail the framework for how FRAND-encumbered SEPs should be negotiated. That latter part follows directly from recent court cases, most notably the decision by the Court of Justice of the European Union in Huawei v. ZTE where judges established the basic pillars of the negotiation framework (see for instance Jacob and Milner 2016). While it has become obvious through court disclosures over the past years that there is indeed a degree of discrimination as far as royalties are concerned, few proposals that have been suggested so far to address concerns about discriminatory practices. This is an area where further guidance is needed because protection against discrimination is critical to ensure the competitive neutrality of standards and SEPs. One approach would be to have SSOs giving clarification for how parties should negotiate in good faith and what that entails in practice. Another approach, currently under consideration in Europe, is to have guidelines issued by regulators on the same matter. A third approach is to establish the equivalent of a license registry or repository where parties to a contract of a FRAND-encumbered SEP would disclose the material conditions of a contract. Such a change would increase transparency and trust. Importantly, it would also increase the ability of both parties to negotiate legitimate ex-post changes of royalties. Many SEP implementers accept the notion of an ex-post change to the price as long as changes are reasonable and do not discriminate between various buyers. The problem now, however, is that the obscurity of the SEP market stands in the way for ex-post royalty corrections that reflect other changes than the essentiality to a standard and its lock-in effect on the industry, i.e. supply and demand dynamics. Furthermore, improved transparency in other aspects, and greater demands on all parties to ensure that the SEP contracts concern technologies that are essential to a standard, would additionally support a greater role for the evolutionary market discovery as far as prices are concerned. If it is regularly the case that SEP implementers lack the information to judge whether all the SEPs they are buying licenses for are essential or not, they are hardly in a position where they can engage in an informed dialogue about allowing greater variation of prices for reasons unrelated to the essentiality of the contracted technology to a standard. Naturally, if the market is considered distorted by multiple layers of non-transparency, the first order of priority is to defend against any misuse of the market power that a standard gives to an SEP holder. Market obscurity reinforces potential problems associated with how prices are determined for FRAND-encumbered patents. While there is no universal formula for how the initial, ex-ante price is determined, the reality is that prices and standard-setting often evolve simultaneously. During a standard-setting process, many technology creators have incentives to patent as much as they can in the territory of the future standard. It is impossible for everyone at this point to anticipate the market utility and valuation of each patent, and the only thing that seems safe to predict is that a patent that will be essential to the standard will increase revenues. But there is often no real market where a valuation can be discovered. Consequently, there are risks that the standard-setting process fails in “getting the prices right” and that markets will not develop as well as they could – and should – if prices were better at reflecting market valuations. Undoubtedly, this is particularly a concern for those companies that signaled an ex-ante price commitment that is lower than what subsequently would be the real market valuation irrespective of the patent being included in the standard or not. One conclusion is that more time in the standard-setting process should be given to establishing the conditions for how to set the price – and, thus, to avoid as much as possible the problem of getting the prices wrong. Discussing the price before a standard is defined is an awkward process in a market-based economy, but the standard itself and the FRAND rules that should govern essential patents change the price mechanism to such an extent that corrections are difficult to achieve at a later point. Many companies participating in the standard-setting process already consider the market aspect of the future standard and have quite an advanced idea about which companies and patents that will be central for the standard to be implemented. It would therefore be natural for the parties involved to engage in a dialogue ex-ante about what the establishment of the standard should mean for the royalty and what factors that could constitute legitimate reasons for ex-post price corrections. In other words, when price and market valuation are such a central part of the market for FRAND-encumbered SEPs to function efficiently, the standard-setting process could improve the evolution of future SEP markets by combining the technical decisions about the standard with transparent discussions about what should constitute the initial price and on what grounds these prices could be amended in the future. Arguably, an initiative by SSOs to facilitate a discussion between companies about prices follows logically from the opinion by the Court of European Justice in the Huawei v. ZTE case. In essence, the court’s attempt to define the key steps of a market negotiation process is about building a normal market and helping the SEP system better conform to normal market practices, like being clear about what product is on offer and why it is essential to a standard. Under standardization, the lion share of the value of a product will be its essentiality to a standard: technologies that are not essential will be valued completely differently. It follows, therefore, that after a decade of SEP disputes and controversy that have made the SEP system unpredictable for many companies, it is time for SSOs to better facilitate the market for SEPs and not just their technical properties. SSOs are effectively creating a market place for technology – and the task now should be to ensure that good markets norms govern the behavior in this market. There are reasons to be optimistic about the future of SEPs. The world economy is at the doorstep of technological developments that would benefit from an SEP system trusted by innovators in up- and downstream markets. Despite growing frictions between various participants in SEP contracts, the reality is that all sides to the equation actually still stand to benefit from an SEP system that delivers on its potential. For the SEP system to become more credible there is some renovation work required. In a way, that work can be described as finishing the design of the SEP market and put more attention on market practices and developments around the actual patent and standard. The most urgent priority is to establish rules and institutions that gradually will make SEP markets more transparent. The ambition is clear and there is no need to beat about bush: market obscurity should be reduced and practices should conform to the basic norm that the implementer of a standard should be able to easily access information about how precisely a license is essential to a given standard and why users need it for the standard to be implemented. After all, that is the whole point of using a standard and the vast part of the value of an SEP. Given that this information is largely asymmetric under the current regime, there is no way to achieve this aim without amending FRAND rules with the view of demanding SEP holders to disclose that information and to allow SEP implementers to appeal the essentiality claim. Standard-setting organizations can take various steps to reduce the incentives for companies to over-declare patents as essential and maintain the essentiality claim despite knowing that a patent is non-essential. However, it is market transparency that is the solution, not necessarily large databases about the technical properties of a patent that will be difficult for many actors to navigate anyway. FRAND rules are regarded as essential to prevent individual companies from gaining and exploiting too much market power. Therefore, ideas that have been proposed for new methodologies to determine the right FRAND price through an RoI or use-based concepts will hardly lead to improvements. Such approaches would increase the uncertainty about the market for SEPs and how prices are determined in the future. They would distort market allocation of resources to innovators in both up- and downstream markets, and, in the case of certain use-based approaches, encourage discrimination between the users to such an extent that competitive neutrality in downstream markets would be affected. There is a strong case to be made for putting greater focus on how prices are determined ex-ante – before the standard has been decided. Courts and authorities are already arguing that the relevant methodology for determining the royalty is what the value of a patent would be if it was not essential to a standard. Even though this constitutes more of a theoretical concept, there are good reasons to live up to this approach in practice: the standard is critically important for how much revenues a patent holder can raise through licensing the patent. This approach, however, often leads to the setting of an artificial price that sometime does not reflect the market valuation of a patent irrespective of its role for the standard. The valuation of a patent would be different if it had not been included in a standard, and that process would have been led by markets. For patents as well as other innovation-based goods and services, it is important to let the discovery process of the market affect their valuation. In a standard that is based on patented technologies, that discovery process is currently stymied from the start by rules that commit holders to a price. A greater degree of transparency around the standard-setting process can protect the market from getting prices wrong. A greater degree of transparency from the SEP holder would create opportunities to correct prices ex-post when there are legitimate reasons to do so. Improvements can happen in different ways. It is important, though, to maintain the basic pillars of a voluntary SEP system and allow the courts to continue having a central place in establishing market norms. It is also critical that changes are coordinated globally. The technologies that are covered by the SEP system are invented, patented, sourced and produced globally. If one jurisdiction deviates from the global trend, it will lead companies to allocate resources and compete on the basis of legal arbitrage. Adams, S. (1997), The Dilbert Future: Thriving on Business Stupidity in the 21st Century, HarperBusiness. Ahmed, K. (2015), Confusopoly – the art of baffling your customers on price, available at: http://www.bbc.com/news/business-32382829, accessed on 16 May 2017. BakerHostetler (2017), UK High Court Issues Important Ruling on Licensing of Standard Essential Patents, available at: http://www.jdsupra.com/legalnews/uk-high-court-issues-important-ruling-93952/, accessed on 28 April 2017. Biddle B., White A. and Woods, S. (2010), How Many Standards in a Laptop (And Other Empirical Questions), Arizona State University Sandra Day O’Connor College of Law. Collins, B. P. (2015), PTAB Refuses to Honor “No-Challenge” Clauses, available at https://www.pillsburylaw.com/en/news-and-insights/ptab-refuses-to-honor-no-challenge-clauses.html, accessed on 17 May 2017. CPI (2013), Standard Setting Organizations Can Help Solve the Standard Essential Patents Licensing Problem, CPI Antitrust Chronicle March 2013 (Special Issue). Ecorys (2014), Patents and Standards: A modern framework for IPR-based standardization, joint study carried out for the European Commission by ECORYS and The Technical University of Eindhoven as part of the ECSIP consortium. Essential Patent Blog (2013), A RANDom glance abroad: German Patent Courts and the “Orange Book” defense, Essential Patent Blog, available at http://www.essentialpatentblog.com/2013/01/a-random-glance-abroad-german-patent-courts-and-the-orange-book-defense/, accessed on 27 April 2017. ETSI (2017), ETSI Intellectual Property Rights Policy, Rules of Procedure as of 5 April 2017, available at http://www.etsi.org/images/files/IPR/etsi-ipr-policy.pdf, accessed on 18 May 2017. European Commission (2017), Roadmap: Standard Essential Patents for a European Digitalised Economy, available at https://www.google.de/url?sa=t&rct=j&q=&esrc=s&source=web&cd=2&ved=0ahUKEwigqcW46dXTAhVH7RQKHYnuBJ4QFggzMAE&url=https%3A%2F%2Fec.europa.eu%2Finfo%2Flaw%2Fbetter-regulation%2Finitiative%2F20114%2Fattachment%2F090166e5b19fda73_en&usg=AFQjCNEuTjrmrOt_tqxEApv8lxz38-hWdw&sig2=izP-r0Nuug27QqJJmvN6-Q, accessed on 4 May 2017. European Commission (2016), Communication from the Commission to the European Parliament, the European Council, the European Economic and Social Committee and the Committee of the Regions: ICT Standardisation Priorities for the Digital Single Market, 19 April 2016. European Commission (2015a), Communication from the Commission to the European Parliament, the European Council, the European Economic and Social Committee and the Committee of the Regions: A Digital Single Market Strategy for Europe, 6 May 2015. European Commission (2015b), Public Consultation on Patents and Standards – A Modern Framework for Standardisation Involving Intellectual Property Rights. European Commission (2014a), Antitrust: Commission finds that Motorola Mobility infringed EU competition rules by misusing standard essential patents, available at http://europa.eu/rapid/press-release_IP-14-489_en.htm, accessed 27 April 2017. European Commission (2014b), Summary of Commission Decision of 29 April 2014 relating to a proceeding under Article 102 of the Treaty on the functioning of the European Union and Article 54 of the EEA Agreement, Case AT.39939 — Samsung — Enforcement of UMTS standard essential patents, notified under document number C(2014) 2891 final, available at http://publications.europa.eu/en/publication-detail/-/publication/2736598c-4b8e-11e4-a0cb-01aa75ed71a1/language-en, accessed on 27 April 2017. European Commission (2012), Antitrust: Commission sends Statement of Objections to Samsung on potential misuse of mobile phone standard-essential patents, available at: http://europa.eu/rapid/press-release_IP-12-1448_en.htm, accessed 27 April 2017. European Commission (2011), Guidelines on the Applicability of Article 101 of the Treaty on the Functioning of the European Union to horizontal co-operation agreements, OJ C 11, 14.1.2011, p. 1-72. Federal Court of Justice of Germany (2009), “Orange Book Judgement” (in German), available at http://juris.bundesgerichtshof.de/cgi-bin/rechtsprechung/document.py?Gericht=bgh&Art=en&sid=acea256584d0e420272381a9d0c7a57a&nr=48134&pos=0&anz=1, accessed on 3 May 2017. Fischer, R. and Pai, J. (2015), Microsoft v. Motorola: the Ninth Circuit upholds award to Microsoft following determination that Motorola breached its RAND obligations, available at http://www.lexology.com/library/detail.aspx?g=3b13436d-a400-41a1-b18d-0ddd0aeb4c4d, accessed on 27 April 2017. Geradin, D. (2014), The Meaning of Fair and Reasonable in the Context of Third-Party Determination of FRAND Terms, George Mason Law Review, Volume 21:4. Gowling WLG (2015), Guidance from the CJEU for SEP owners on abuse of a dominant position, available at https://gowlingwlg.com/en/united-kingdom/insights-resources/guidance-from-the-cjeu-for-sep-owners-on-abuse-of-a-dominant-position, accessed 27 April 2017. IP Watch (2016), Post-Huawei v ZTE: Are FRAND Negotiations Finally More Balanced In Europe?, https://www.ip-watch.org/2016/07/13/post-huawei-v-zte-are-FRAND-negotiations-finally-more-balanced-in-europe/#_ftn2, accessed on 11 April 2017. Jacob, R. and A. Milner (2016), Lessons from Huawei v. ZTE, 4iP Council publication, available at http://www.4ipcouncil.com/application/files/6314/7928/6022/Lessons_from_Huawei_v_ZTE_-_RJacob_-_24-10-16.pdf, accessed on 18 March 2017. JRC (2015), Fair, Reasonable and Non-Discriminatory (FRAND) Licensing Terms – Research Analysis of a Controversial Concept, JRC Science and Policy Report, European Commission, Joint Research Centre, Institute for Prospective Technological Studies. Mueller, F. (2012), European Commission issues Statement of Objections against Samsung over SEP abuse, available at http://www.fosspatents.com/2012/12/european-commission-issues-statement-of.html, accessed 27 April 2017. Muris, T. (2017), Bipartisan Patent Reform and Competition Policy. American Enterprise Institute. Nurton, J. (2015), Huawei v ZTE – analysis from across Europe, available at http://www.managingip.com/Article/3472461/Huawei-v-ZTEanalysis-from-across-Europe.html?utm_campaign=Email+verification&utm_content=2017-04-24&utm_term=Verification+link&utm_medium=Email+operational&utm_source=Registration+Form&r=verified, accessed on 27 April 2017. NYT (2012), Apple-Samsung Case Shows Smartphone as Legal Magnet, by Steve Lohr, http://www.nytimes.com/2012/08/26/technology/apple-samsung-case-shows-smartphone-as-lawsuit-magnet.html, accessed on 11 July 2017. Kalaycı, K. (2015), Confusopoly: Why companies are motivated to deliberately confuse, available at: http://theconversation.com/confusopoly-why-companies-are-motivated-to-deliberately-confuse-39563, accessed on 30 July 2017. Pohlmann, T. and Blind, K. (2016), Landscaping study on Standard Essential Patents (SEPs), commissioned by the European Commission, DG Grow. Putnam, J. (2016), Latest developments in FRAND and SEP litigation, available at http://www.iam-media.com/intelligence/IAM-Yearbook/2016/Country-by-country/Latest-developments-in-FRAND-and-SEP-litigation?vl=1559248472, accessed on 18 May 2017. Regibeau, P., De Coninck, R. and Zenger, H. (2016), Transparency, Predictability, and Efficiency of SSO-based Standardisation and SEP Licensing, A Report for the European Commission, CRA Charles River Associates. Royal Court of Justice (2017), Approved Judgment on Unwired Planet International v. Huawei Technologies, available at: https://www.judiciary.gov.uk/wp-content/uploads/2017/04/unwired-planet-v-huawei-20170405.pdf, accessed 28 April 2017. Schweizer, M. (2010), Dutch see Orange Book differently – Philips prevails again, Ipkitten.blogspot.be, available at http://ipkitten.blogspot.be/2010/03/dutch-see-orange-book-differently.html, accessed on 27 April 2017. Shen, D. and Ge, J. (2017), Iwncomm v. Sony: first SEP-based injunction granted in China, available at http://www.lexology.com/library/detail.aspx?g=195043c8-52ba-4b52-a8c1-6b087490d523, accessed 28 April 2017.
van Audenrode, M., Royer, J., Stitzing, R. and P. Sääskilahti (2017), Over-Declaration of Standard Essential Patents and Determinants of Essentiality, available at https://papers.ssrn.com/sol3/papers.cfm?abstract_id=2951617, accessed on 17 May 2017. In 2009, the Durch company Koninklijke Philips Electronics N.V. (Philips) brought a patent infringement suit against the German company SK Kassetten GmbH & Co. for a patent, which it owned and which had become essential to a set of standards called the “Orange book”. It concerned a series of technical specifications for compact discs called “the rainbow books” and relates to the CD-R interoperability. On its part, Philips did not declare its patent as essential or potentially essential, as intellectual property law did not require the company to do so. Finding that SK Kassetten and several other manufacturers of CD-Rs had failed to seek out a license from Philips, the company sought an injunction and money damages. Nevertheless, in this particular case, the District Court The Hague later determined that SK Kassetten could not make use of the Orange Book Defense, as it had not requested a patent from Philips, nor payed any royalties, and that it could therefore not be applied under Dutch law in the case (Schweizer 2010). In 2010, Microsoft Corp. sued Motorola Inc. over claims that the organization had breached its contract and broke its RAND commitments, following its offer to license its SEPs at a rate of 2.25% of the price of the end product. Motorola held patents essential to the H.264 standard in video coding technology and the 802.11 standard in wireless communications (the “WiFi” standard), and committed to relevant SSOs setting those standards that they would license their SEPs on RAND terms. Microsoft’s Windows operating system incorporates the H.264 standard. Microsoft’s Xbox video game console incorporates both the H.264 standard and the 802.11 standard (Fischer and Pai 2015). Motorola immediately launched a counter suit, claiming that Microsoft had infringed its H.264 patent on video coding technology. Western District Court of Washington accordingly determined that RAND commitments made on the part of Motorola demand that the firm’s offers to license SEPs be made in good faith, complete with RAND royalty rates. In this case, however, both parties disagreed as to what constitutes RAND royalty rates, leading the court to issue its own 207-page opinion recreating the hypothetical negotiations between the two parties. The court accordingly determined that the royalty rates for Motorola’s video coding SEPs should be 0.555 cents per unit, and 3.471 cents per unit for its WiFi SEPs. Given that Motorola’s offer of 2.25% amounted to a few dollars per unit, the court found that Motorola had breached its RAND obligations and demanded that the firm pay Microsoft $14.32m in damages. At an appeal at the Ninth Circuit court, judges affirmed the decision of the district court. Whereas Motorola argued that the district court did not have the authority to decide the RAND rate, the Ninth Circuit held that the organizations’ consent to a bench trial determination of the rate waived this argument. Furthermore, the Ninth Circuit agreed with the district court that enforcing RAND-encumbered patent through injunction violates the duty of good faith and fair dealing, and that Washington law allows damages to include costs of defence against injunctive action. In October 2010, Motorola Mobility filed a complaint with the International Trade Commission (ITC) against Apple Inc. alleging patent infringement. The complaint allegations concerned a number of Motorola patents. Motorola sought several remedies including an injunction prohibiting Apple from importing, marketing and distributing infringing products. Motorola also filed two further complaints for patent infringement against Apple in the U.S. District Court for the Northern District of Illinois the U.S. District Court for the Southern District of Florida. In response to Motorola’s claims, Apple filed a complaint with the ITC for patent infringement against Motorola, Inc. and Motorola Mobility, Inc. In addition, Apple filed counterclaims in the Southern District of Florida in later in 2010, alleging Motorola infringed several Apple patents in manufacturing and selling several electronics devices. A number of back and forth procedures took place before Motorola filed patent infringement complaints in Germany in 2011, alleging that Apple Retail Germany GmbH, Apple Sales International, and Apple Inc. infringed two of Motorola’s SEPs. After finding Apple to infringe some of Motorola’s patens, the Germany court granted injunctions. Apple in turn filed patent infringement suits against Motorola in in Munich, Düsseldorf and Mannheim (Germany), after which the Munich court granted an injunction. Apple made six license offers to Motorola. Apple’s second offer provided Motorola an opportunity to set royalty rates at their own discretion and according to FRAND principles. It also allowed both companies to submit their assessments for a consideration by courts. Apple’s offer was nonetheless rejected, and the German courts granted an injunction that same year. In 2012, when Motorola made the decision to enforce the injunction, Apple made its sixth license offer, which included a clause entitling Motorola to terminate the contract if Apple ever challenged Motorola’s patents’ SEP’s validity. The offer also explicitly acknowledged Apple’s responsibility in the infringement of the licensed SEPs by all of its phones currently on the market. This led the German courts to temporarily suspend the injunction. Following a complaint by Apple, the European Commission launched an antitrust investigation and concluded that Motorola was indeed abusing its dominant position by refusing to license its SEPs and by seeking injunctive relief without justification, given Apple’s willingness to enter into a licensing contract. The European Commission also found Motorola’s decision to insist “that Apple give up its rights to challenge the validity or infringement by Apple’s mobile devices of Motorolan SEPs” to be anti-competitive (EC 2014). Given that there was no case law dealing with this issue under Article 102 TFEU, the Commission decided not to impose a fine on Motorola (European Commission 2014a; Gowling WLG 2015). Starting in 2011, Samsung Electronics Co., Ltd. began seeking preliminary and permanent injunctions against Apple, as part of a patent war the two firms have been waging since Apple first began suing Samsung for patent infringement earlier that year. Several lawsuits were launched in South Korea, Japan, Germany, France, Italy, The Netherlands, Australia, the United Kingdom and the US. For Samsung’s Universal Mobile Telecommunications System (UMTS) SEPs, which Samsung had committed to license on FRAND terms in 1998, the European Commission issues a preliminary view regarding this matter in 2012, as well as a decision in 2014, stating that, because Samsung had committed to issue licenses on FRAND terms, and because Apple had not shown itself to be unwilling to negotiated licenses, recourse to injunction in this case qualifies as harmful to competition. In light of the commitments offered by Samsung, the European Commission therefore considered that the legal proceedings should be brought to an end. According to Mueller (2012), although the Commission chose not to take a position on what constitutes a FRAND royalty rate, the statement by the Commission essentially implies that Samsung’s demand for 2.4% royalty is to be considered excessive, otherwise the Commission would expect Apple to meet that demand and would not refer to Apple as “willing to negotiate a FRAND license.” While Samsung subsequently withdrew its injunction requests, the European Commission refrained from altering its conclusions (European Commission 2014b; 2012). Following failed negotiations over the licensing of a patent owned by Huawei to ZTE, Huawei decided to seek an injunction over patent infringement. The SEP in question constitutes a part of the Long Term Evolution (LTE) standard. It was declared essential or potentially essential by Huawei in 2009 and has been licensed on FRAND terms to third parties since. In ZTE’s defense, the company asserted that Huawei was abusing its dominant position in seeking injunctive relief. Nonetheless, the Düsseldorf District Court (Germany) found that ZTE was infringing Huawei’s SEP. Following the inconsistencies to approaches to this issue, the German court referred questions to the European Court of Justice (CJEU), which in 2014 provided some clarifications, the most important of which is that if a claim of dominant position is made, justifications must be made beyond the simple fact of ownership of an SEP, such as the patent owner refusing to license despite having made FRAND commitments. As well as providing a general framework for determining whether there has been abuse of dominance, the CJEU explained that where a prospective licensee is holding appropriate security in the form of a bank guarantee or an amount held on deposit, he can be considered willing to enter into a license contract. Additionally, the CJEU offered a distinction between seeking injunctive relief, which may be considered abuse of a position of dominance, and seeking damages, which would not necessarily. Although this is a major decision, the question of what qualifies as “FRAND terms” still remains open (Gowling WLG 2015; Nurton 2015). In 2014, Unwired Planet International Ltd sued Huawei Technologies Co. Ltd and Huawei Technologies (UK) Co. Ltd, along with Samsung and Google, for the infringement of six of its UK patents, following a dispute during non-technical trials concerning a number of its SEPs. During the proceedings, Unwired Planet offered the licensing of its entire global portfolio (including non-SEPs) to the defendants, which they refused, denying infringement and questioning the validity and the essentiality of the SEPs. The next offer made by Unwired only concerned its SEPs, but was refused again, on the argument that the offer was not based on FRAND conditions. The proposed global rates were 0.2% for 4G LTE and 0.1% for other standards, and concerned average selling prices for mobile devices and revenues for infrastructure. At this point, Samsung and Google settled, but not Huawei, whom the British Royal Court of Justice found to be infringing. Unwired Planet argued that the patentee should be entitled to seek injunctive relief if both parties make FRAND offers, assuming these would imply the adherence to FRAND commitments on the part of the patentee. Huawei conversely argued that injunctions should not be allowed in such a case where the patentee is refusing a licensee’s FRAND terms, as the purpose of FRAND is to benefit implementers of technology. In 2017, the High Court ultimately set out the history and fundamental principles of FRAND as well as, for the first time in the English courts, a full analysis on the rates and terms of a FRAND license. The court decided that an SEP holder must agree to license its technology on FRAND terms, and that those licenses must be global for global players, instead of limiting a license to a single jurisdiction on a country-by-country basis, e.g. the UK. Additionally, the High Court decided that only one FRAND royalty rate must exist for any given set of SEPs, rather than a FRAND range with sets of rival FRAND licensing terms (although this does not imply that parties do not have room to negotiate royalty rates). Accordingly, in the dispute at hand, the High Court used comparable industry licenses to determine that neither party had made offers compliant with FRAND terms, and examined all factors in Unwired’s portfolio to determine the appropriate rate. Finally, the Court argued that refusal to offer licenses on FRAND terms constitutes a breach of FRAND commitments. In the case of a patent infringement, licensees who refuse to accept valid FRAND terms for a license are liable to injunctions. In this case, were Huwaei not to act according to the Court’s ruling, an injunction would be granted to Unwired (BakerHostetler 2017; Royal Court of Justice 2017). In the first injunction granted during the proceedings in a case of infringement of an SEP in China, the Beijing IP Court ordered a permanent injunction on Sony and demanded that it pay 9 million (1.2m EUR) in damages for past infringement. The SEP in question held by Iwncomm contributed to the standardization of China’s WLAN Authentication & Privacy Infrastructure (WAPI) standard. Iwncomm had committed to license the SEP on FRAND terms. This commitment declaration nevertheless did not specify the patent numbers of the associated SEPs. After six years of licensing discussions with Sony, Iwncomm filed a suit, alleging that the firm had infringed its Chinese SEP (Patent No. ZL 02139508.X). Although Sony launched invalidation proceedings before the Patent Re-examination Board, the latter upheld the validity of the patent in question in 2016. The court had to consider whether the parties had fault in prior licensing negotiation in deciding whether to grant an injunction. The court had to find whether infringement had occurred and whether the defence of patent exhaustion was applicable in this case. The court affirmed that a permanent injunction is generally available against an unwilling licensee. On infringement, the Court decided that Sony had committed both direct and contributory infringement. The former through exit-factory testing on its handsets, and the latter through the facilitation of the use of the standard by handset end users. Concerning patent exhaustion, Sony argued that it had purchased the chipsets associated with the WAPI functionality from Qualcomm and Broadcom, and that Iwncomm had granted both providers with licenses. Nevertheless, the Court offered that according to Article 69(1) of the Patent Law, patent exhaustion only applies to products “directly obtained using the patented method,” so that using a patented method is not covered by this defence. Finally, the Court dismissed Sony’s argument that since the patent in-suit was an SEP and Iwncomm had made FRAND commitments to license it, it should not be liable to patent infringement, stating that FRAND commitments do not say that a license is granted, stating that “it is not possible to conclude that a patent license is concluded simply based on the FRAND declaration”. Clarifying its position, the Beijing IP Court set out that FRAND commitments entail that SEP implementers have a rational basis to use SEPs, but that this basis relies on good-faith negotiations. In deciding whether to resort to injunctive relief if negotiations fail, the Court should consider who is at fault, if anyone. Accordingly, injunction requests should be denied where no party is at fault, or where the patentee is at fault but not the licensee. Where both parties are at fault, injunction should be granted based on who bears the most fault. In this case, deadlock arose from Sony’s insistence that Iwncomm furnish a non-confidential claim chart to allow it to assess its assertion. In considering Iwncomm’s refusal to do so without an NDA in place, the court found its position reasonable, as such a chart is not necessary to assert infringement. The delaying tactics employed by Sony thus form part of the reason why the Court found that Sony was at fault (Shen and Ge 2017; LexField 2017).